We were walking around in Coles the other day, and Mich got all excited about the Aeroplane Jelly that was on sale. See, she's studying Chemical Engineering, and the current subject she's taking - BioNanoEngineering - well, plays a big role in Aeroplane Jelly, or any jelly, for that matter. So we got a couple of boxes of the stuff. I made some last night, but didn't get around to eating it until this afternoon. 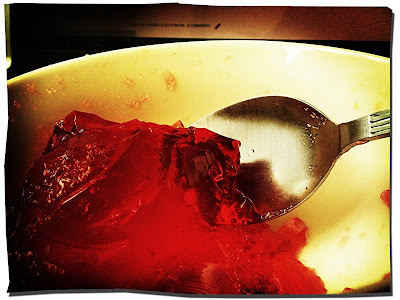 There's something about the soft texture, and the bright red colour of strawberry jelly. It reminds me of those hi-tea sessions my parents used to take us to at Holiday Villa when we were younger. I loved it! The pastries, the fruit, oh, it was all so heavenly! Jelly also, for some reason, reminds me of that scene in Jurassic Park, when the kids find their way back into the main hotel and find the buffet all laid out and ready to eat, and one of them digs into a giant plate of jelly....and then the raptors attack but that's not really relevant. That jelly looked amazing!